Great Northern Adventures is dedicated to the magnificent Great Northern Pike and those mere mortals who pursue them. Esox Lucius is the scientific name for the fish but, unless you speak Latin as a first language, that name does not conjure up any magical images like its everyday English name. The name alone puts me in a reverie and starts an uncontrollable urge to grab my fishing rod and head North to Canada. 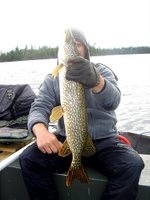 The pike has world wide distribution and is known by many names - pike, northern (U. S.); jackfish, pickerel (English Canada); grand bochet (French Canada); wasserwolf (Germany); shuka (Russia); luce (Italy); lance (France); and hauki (Finland). I really like the German name which translates to waterwolf. That says it all. The Great Northern Pike is a voracious predator. We have seen pike miss the lure and bite the steel leader, refusing to let go until it was at the boat. We have seen a pike miss a surface lure as it jumped out of the water but nailed it on the way down. 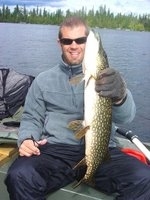 Check the size of the pike below, barely bigger than the lure he tried to devour. Books on cassette tape or CD make even the longest car trip seem like a short commute. Check your local library for your favorite author. We recommend mysteries that keep you on the edge of your seat. A small cooler with snacks and/or a meal will shorten your stops. Do not drive while drowsy, switch drivers or pull off the road for a nap. We always have the co-pilot stay awake to monitor the driver. The driver is never the sole awake person in the vehicle. If we pull off the road to nap, we both nap. A trip ticket from AAA, or equivalent, will let you know where road construction might slow you down, allowing a contingent alternate route. Radar detectors are illegal in some provinces of Canada (Manitoba, Northwest Territories, Newfoundland, Ontario, Prince Edward Island, Quebec, and Yukon) and really not needed. In all our travels in Canada, we have yet to see a radar trap. Canadian drivers seem more courteous than their American counterparts. We recommend you follow their customs in that regard. Also drive with your headlamps on low beam even during the daylight hours. This is especially important in passing situations on two lane roads. An easy way to split car expenses is for each person to contribute an equal amount to a kitty which pays all gas, oil, and tolls. U. S. auto insurance is accepted as long as you are a tourist in Canada. Proof of auto insurance is required. So you are 100 miles from the nearest cell phone tower and have a life threatening emergency. What does one do? 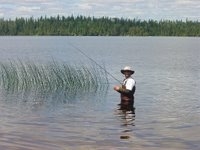 Well, after my by pass surgery, my wife was reluctant to see me go into the wilds for fishing. I did some research and then rented a Emergency Position Indicating Broadcast (EPIRB) unit from Boat US. This quieted even her qualms. She has more common sense about health issues than I do, anyway. Another way to assure safety in an emergency is to rent a satellite phone. Be sure to program in the nearest emergency number into the rented unit. We have no personal experience in these rentals so we have no specific recommendation. Our insurance agent is a big time hunter and fisherman and rents a unit whenever he goes outside of cell phone range. When carrying cell or satellite phones in the boat, use a waterproof container that floats. We recommend you bring a good first aid kit and first aid guide. It is important you know what to do in case of a serious accident. Be sure to bring all your prescriptions and your favorite pain medication, just in case. Be sure all members of the party know CPR. We recommend you fish with barbless hooks. You will not lose any fish if you keep the line under tension at all times. A barbless hook allows for easy removal and less trauma for the fish. We never boat the fish preferring to remove the hook while the fish is at the side of the boat. Never grab the line to maneuver a fish while it is boat side. You might see bass fisher- men grab the line and get away with it. Imagine the line pulling against the tender skin of your finger at 20 miles per hour as a pike makes yet another run. We never net a pike as it removes the protective slime from the fishes scales leaving it vulnerable to infection. Instead, we grab the fish firmly behind the head. Be sure to wet your hand or glove before handling pike. Holding a pole too high as the fish nears the boat encourages the fish to jump, increasing the possibility of the line going slack and the fish throwing the lure. Always allow the pole to act as a shock absorber for the strong pulls, vicious jerks, and long runs the pike will give. A jumping fish does make for an exciting video shot by your partner but, chances are he would not be ready. Yes, we do bring a camcorder with us on the boat. We do not believe in killing a fish for a trophy. A video is a more exciting way to remember the experience. Handle the fish gently and with respect. Pike will fight until completely exhausted, so it is important to revive the fish before releasing it. Hold the fish in a swimming position and move it back and forth allowing water to move through it's gills. Watch the fish carefully until it swims away. We eat only the rare fish that does not survive being caught and released. Returning the fish to the water allows you to enjoy catching it next year (or even next cast). As improbable as it sounds, my son, Michael caught the same pike on two successive casts. 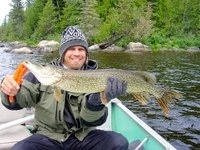 In 2007 we caught an released 116 pike and 6 walleye in good condition. Our philosophy is. if you want to eat fish, go to a restaurant that specializes in sea food. Why deplete the stock of fish in your favorite lake? The lunker you release will be even bigger next year. Big pike move with the seasons. In Spring, try the weed beds. The fish finder can help you find where the bait fish are suspended. Once the bait fish are found, fish the towards the deeper water adjacent to them. Remember, to a big pike, just about anything smaller is dinner. 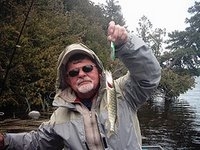 In 1997, we fished Lake Anjigaming, a small lake in Ontario noted for its large pike. I noticed something swimming near the surface of the water just off an active beaver house. A cast towards the fish resulted in a weak strike and a lethargic struggle. We took the hook out of a 24 inch pike and examined it. There were bite marks of a huge fish on both its sides. Our mouths dropped in wonder at the thought of the monster that feeds on a two foot pike. Needless to say, we fished even harder the rest of the week. Michael say he missed that big one last year due to sloppiness. We nearly always start the fishing day by removing the last 5 to 10 feet of line that has most likely been weakened by abrasions. On that morning, Michael failed to remove the weak line and, as luck would have it, the big one hit. The fight lasted all of 10 seconds before the line broke. It is important to discipline yourself and not be lured into a false sense of security because the fishing is slow, the scenery is breathtaking, and the sun overhead cooks your brain to a lazy mush. We like to troll fast with deep diving lures when the fish are deep. Lures designed to dive 20 feet or so. 2007 Update - Flint Lake, Longlac, Ontario Michael and I caught 116 pike and 6 walleye on barbless hooks returning them to the water in good condition. I am pleased to report that all fish survived their brief encounter with humans. The largest pike took our breath away. We estimated it was 42 to 45 inches long and 22 to 24 pounds. The girth of this fish was awesome. It broke the 12 lb. test at the side of the boat. A caught fish in our book. Our regret is not being able to remove the lure for the harm it might cause this magnificent creature. We think we did not play the fish sufficiently to tire him out as he went berserk upon seeing the boat. 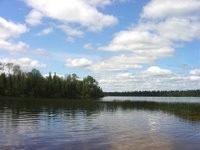 Flint Lake can be accessed only from Klotz Lake and down 2 sets of rapids. Not bad going with the flow of water but a real chore pushing/pulling boat against the current. Michael and I fished later in the summer, August 5 through the 12th. We found the big fish in deeper waters. We fished with diving plugs and Laker Taker spoons fished 18 inches behind a heavy sinker. We caught 160 fish all returned to the water essentially unharmed. One pike was apparently brought up too quickly from the deep water and had trouble with his air bladder. He did not need revived and resisted our efforts to do so. We were totally surprised and dumbfounded never having encountered this before. We can only hope he survived long term. Michael and I had a fabulous year. Caught 174 pike and 1 walleye for the week. All returned to the water. We caught the walleye in the weeds, a brave (or foolhardy) fish as we caught pike in the same spot also. On the way home, we saw a lone timber wolf walking along the road. He looked confused. We should have stopped to take a picture but did not want to disturb him. Another fine year of fishing on Flint. Many fish were caught and released. We found walleye in the weeds with the pike. ????? what were they thinking? Interesting though, the walleye hit and fought like pike. Who knew? We had a rough time coming up the rapids. I was totally exhausted by the time we got the boat to the head of the rapids. I need to start working out. At 73 years of age, I am becoming too wimpy. Michael and I introduced his son Gavin, age 9, to pike fishing. 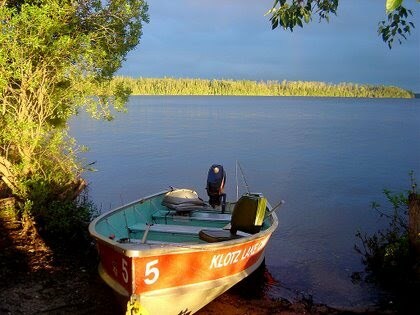 We fished Klotz Lake because the remote cabin might prove to be too much for a 9 year old. Fishing on Klotz Lake was painfully slow. One had to watch his rod tip to see the timid taps and virtually guess when the pike might be there. We caught a total of 5 pike all week, all caught by guessing the pike may be near the hook after a series of taps. I have never seen pike act like tiny perch before. Remarkably, Gavin was OK with all this disappointment. He will make (is) a good fisherman. He never complained. I hooked a fish and gave the rod to him to "catch" the fish, a small pike. He liked that. 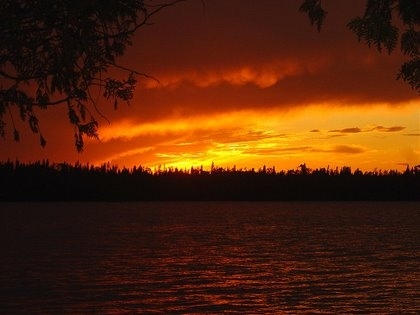 Next year..... the Flint Lake remote cabin. I can hardly wait! Michael, Gavin. Derek, and I stayed at The Klotz Lake Camp Remote Cabin on Flint Lake. The weather was unseasonably hot. We caught just over 100 pike (low for this lake), all fighters and some good size ones, none really large. Gavin at 10 years of age handled the "rustic" cabin well. As Derek was able to help haul my 14 foot jon boat up the rapids on Hoiles Creek, I was able to observe the effort involved compared to a semi-v 14 foot rental boat. The fast moving water pushed against the flat front of the jon boat greatly increasing the effort required. The semi-v rental was a piece of cake by comparison. I also ran the rental with my 9.5 HP Johnson outboard. It moved nearly briskly as the jon boat with the 25 HP, and it handled better. The jon boat has its place but not in Flint Lake. I will sell it this year. Boat sold....... I feel naked. Now looking for a semi V 14 foot aluminum boat with a good trailer. Sadly, no trip to Canada this year. A short summer for Michael, a teacher, coupled with family obligations, and some health problems on my part (now mostly resolved) caused us to cancel the trip. Hopefully we will begin again in 2014. Notice the orange fish grabber. We used this for the first time this year and highly recommend the product as it helps subdue the pike quickly. They suffer less trauma getting them back into the water, not to mention the increased safety for the fish handler. The Fish Grip is manufactured by United Plastic Molders of Jackson, MS (800 890-5113). We bought it from Cabelas for $12.99.